After the influenza virus was finally identified in 1933, researchers immediately started to develop a vaccine. The first flu vaccine was approved for U.S. military use in 1945 and for civilian use in 1946. Unfortunately, the flu has several types, and many types come in multiple strains—each of which has to be included in a vaccine to provide protection. Each year, scientists make their best prediction as to which flu variants will circulate that year and prepare a vaccine that treats a combination of the most likely strains. Sometimes the match is a good one, but sometimes unexpected strains mean the vaccine is less effective. Immunity also wears off and different strains emerge—which is why it’s important to get a flu shot every year. 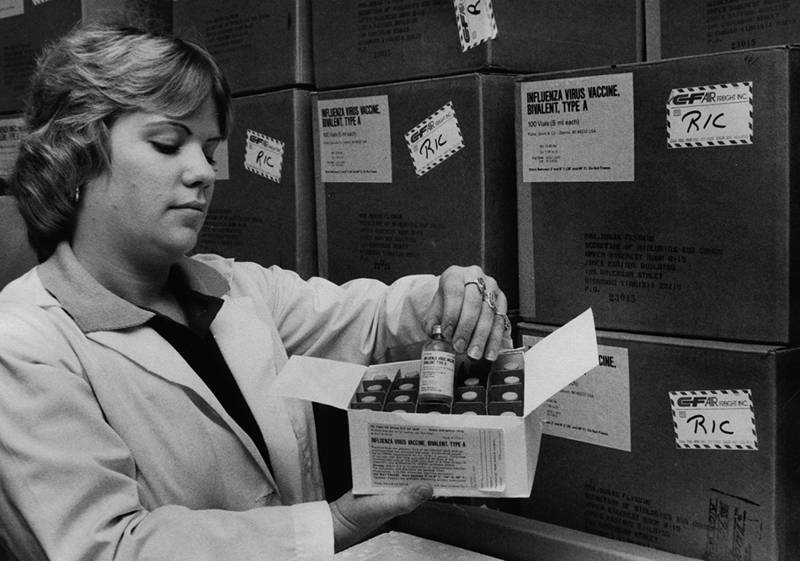 Clark, Wallace Huey (photographer)., “Influenza virus vaccines for Richmond region,” Social Welfare History Image Portal, accessed April 24, 2019, https://images.socialwelfare.library.vcu.edu/items/show/305.